Embedding and extending exemplary academic integrity policy and support frameworks across the higher education sector (Exemplary Academic Integrity Project) aimed to extend and embed the five core elements of exemplary academic integrity policy identified by the recently concluded Academic Integrity Standards Project (Bretag et al 2010-2012) – access, approach, responsibility, detail and support – across the Australian higher education sector. Central to these elements is a commitment by providers to fostering a culture of academic integrity. Within the higher education context, the Exemplary Academic Integrity Project (EAIP) was a strategic collaboration between UniSA as project leader, Griffith University researchers and policymakers and Queensland Institute of Business and Technology (QIBT). Griffith University has been working with QIBT, a private (Navitas) higher education provider at the college level, since 1997. The partnership offers a pathway to university for international and domestic students. In this context these two institutions have worked collaboratively to address issues of English language proficiency and academic integrity to assure quality learning outcomes. UniSA, as lead institution, also has a close working relationship with the South Australian Institute of Business and Technology (SAIBT) which is another Navitas college. One of the reference group members, La Trobe University, also has a relationship with a Navitas college, the La Trobe University International College (LTUIC). The participation of these Navitas colleges in the project assisted to embed exemplary policy and support frameworks across both public and private providers. As support is crucial to enact exemplary policy, this OLT project developed resources accessible to both public and private higher education providers to embed these elements. Two critical areas identified by Bretag et al (2012) were addressed in this project. First, support systems were developed for vulnerable student groups including international English as an Additional Language (EAL) students, and educationally ‘less prepared’ students who struggle to understand the concept of academic integrity without assistance. Second, the lessons about exemplary academic integrity policy and support frameworks were extended to include higher degree by research (HDR) students. 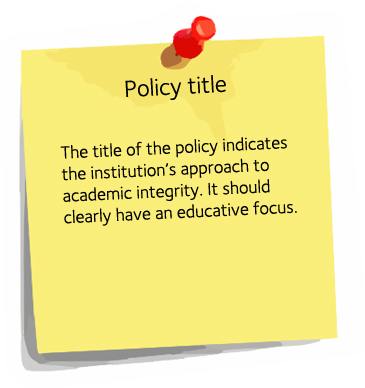 An academic integrity policy toolkit for Higher Education private providers in an interactive online format. High level summary document suitable for a wide variety of audiences. The project conducted activities over a 12 month time frame in three phases. Formative evaluation was included in all phases of the project. academic integrity policy and support frameworks for HDR students. Phase 2 (months 8-10), the resources developed were trialled and the academic integrity policy and support frameworks developed were finalised. Some formal dissemination was conducted at the end of this phase. Phase 3 (months 11-12) further formal dissemination, summative evaluation and submission of the final report to the OLT. (by research), Director: Global Experience Program, University of South Australia. Bretag brings extensive research experience on academic integrity to the group. Bretag has been the Chair, Co-Chair or Deputy Chair of The Asia-Pacific Forum on Educational Integrity (APFEI) (http://apfei.edu.au), since it was founded in 2003. She is also the Deputy Chair and in-coming Chair (2013) of the Advisory Council to the International Center for Academic Integrity (ICAI). She has written extensively about academic integrity issues and is also the founding Editor (since 2005, originally with Helen Marsden) of the International Journal for Educational Integrity (http://www.ojs.unisa.edu.au/index.php/IJEI ). In 2011 Bretag was awarded the ICAI Exemplar of Integrity Award, in recognition of her contributions to the field of academic integrity. 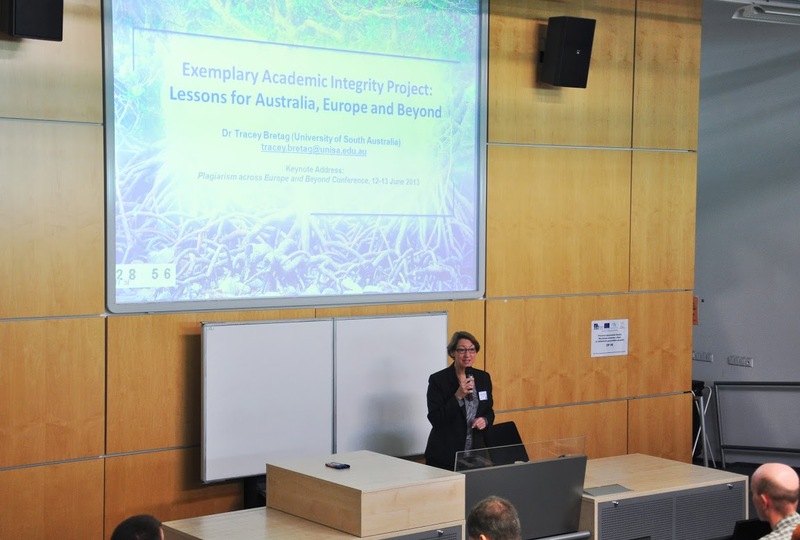 From 2010-2012, Bretag was the Project Leader of the Australian Learning and Teaching Council Priority Project: Academic integrity standards: Aligning policy and practice in Australian universities. Project Manager: Saadia Mahmud, MBA, MPhil, Phd, Research Fellow, University of South Australia. Mahmud brings extensive project management experience to this OLT project. She has been on UniSA led research grants since 2009, and was the Project Manager on the ALTC Academic integrity standards: Aligning policy and practice in Australian universities project, and former Project Manager of the ALTC project, Moderation for fair assessment in transnational learning and teaching (2008-2010). After a decade of working in banking and finance in project management roles, Mahmud joined UniSA in 2001. Her doctoral thesis entitled “Role of self-organisation in the handling of adaptive challenges by enterprises” found that open and honest communication and trust were related to the ability to self-organise and being adaptive to change. The vital role of honesty and trust in organisations is a recurrent theme in her work and she has published numerous articles and conference papers with Bretag on issues of academic integrity. drafted both Griffith’s Institutional Framework for Promoting Academic Integrity Among Students and the Policy on Student Academic Misconduct, as well as guided the development of the Student Academic Integrity Management System (SAIMs) within the PeopleSoft Student System. Karen has over 20 years’ experience in managing and implementing evidence-based institution-wide policy projects often underpinned by the development of large Information Technology (IT) solutions. Her work in academic integrity is currently being extended to building a framework for developing professional integrity among Griffith’s students in the context of student registration by professional bodies and increased involvement in work-integrated learning. Karen brings to the project practical experience in the decision-making processes that guide the development and administration of policy. Anna Stewart led the Griffith-wide development and implementation of the Griffith University Institutional Framework for Promoting Academic Integrity among Students. During this time she worked closely with Karen van Haeringen to develop the necessary policy framework and resources. Professor Stewart’s academic background includes being a Head of School and Deputy Dean (Learning and Teaching) and an internationally recognised researcher in youth justice, prevention science, evaluation science and policy analysis. She brings to the project a sound theoretical and empirical evidence base and she will ensure the implementation and evaluation strategies are practical and appropriate. Professor Stewart also has a strong interest in the development of a framework for HDR students. She has supervised eight PhD students to completion and currently supervises 10 PhD students. She has examined 16 HDR theses. She has published over 60 peer-reviewed publications, government reports and non peer reviewed publications. She has been involved in partnerships that have obtained over four million dollars in National Competitive Funding (including six ARC grants), consultancies and other government research funding. Leigh Pointon is the Director of Academic Programs and Student Services at the Queensland Institute of Business and Technology. Leigh has approximately 20 years’ experience delivering higher education courses within the university and private education sectors. She has considerable experience teaching EAL students, and managing and delivering higher education programs across a broad range of disciplines to educationally ‘less prepared’ students. QIBT and Griffith University have worked tirelessly in their attempts to ensure graduates of QIBT enjoy a seamless transition to their university programs. A cornerstone of the successful transition is the cross institution consistency in policy; in particular those around learning and teaching. QIBT also has a strong affiliation with the other Australian and international Navitas pathway colleges, and plays a pivotal role in the development and dissemination of Learning and Teaching, and Governance policy and practice within the Navitas University Pathway Division (UPD). Dr Helen Marsden, Australian National University, Canberra; Champion for Academic Integrity for the ‘Best practice framework to inform and guide higher degree research training excellence’ OLT project led by Dr Joe Luca in collaboration with the DDoGS group (Deans and Directors of Graduate Studies); member of ALTC Academic Integrity Standards project reference group (2010-2012). Dr Erica Morris, Senior Advisor: Higher Education Academy JISC Academic Integrity Service (UK). Morris is the lead author of the Higher Education Academy (HEA) JISC Academic Integrity Service, Policy works: Recommendations for reviewing policy to manage unacceptable academic practice in higher education, and Supporting academic integrity: Approaches and resources for higher education (2011). Dr Tricia Bertram Gallant, Academic Integrity Coordinator , University of California, San Diego; author of Academic Integrity in the Twenty-First Century: A Teaching and Learning Imperative (Jossey-Bass, 2008); co-author of Cheating in School: What We Know & What We Can Do (Wiley-Blackwell, 2009); editor of Creating the Ethical Academy: A Systems Approach to Understanding Misconduct & Empowering Change (Routledge, 2011); member of ALTC Academic Integrity Standards project reference group (2010-2012). Professor Margaret Hicks, Director: Learning and Teaching, University of South Australia; member of ALTC Academic Integrity Standards project reference group (2010-2012). Ms Jennifer Martin, Student Academic Integrity Coordinator, Griffith University. Her role supports academic staff university-wide in managing cases of academic misconduct within the Institutional Framework for promoting Academic Integrity Among Students. Ms Martin was a member of the Academic Integrity Standards project reference group (2010-2012). Associate Professor Wendy Loughlin, Dean (Learning and Teaching), Science, Environment, Engineering and Technology Executive; Chair of the University Assessment Committee, Griffith University. Assoc Prof Loughlin is one of only four Tier 2 academic integrity breach decision-makers at Griffith University. Professor Julie Jackson, Pro Vice Chancellor: Educational Partnerships and Quality, La Trobe University. Mr Bruce Carboon, Director: Academic Services, La Trobe University. Winthrop Professor Jane Long, Pro Vice Chancellor: Education, University of Western Australia. Professor Helen Borland, Director of the Office for Postgraduate Research, Victoria University. Associate Professor Bill Eckersley, Associate Dean Teaching and Learning, Faculty of Arts, Education and Human Development, Victoria University. Ms Annmaree Mifsud, Senior Advisor to Pro Vice Chancellor, Research & Research Training, Victoria University. 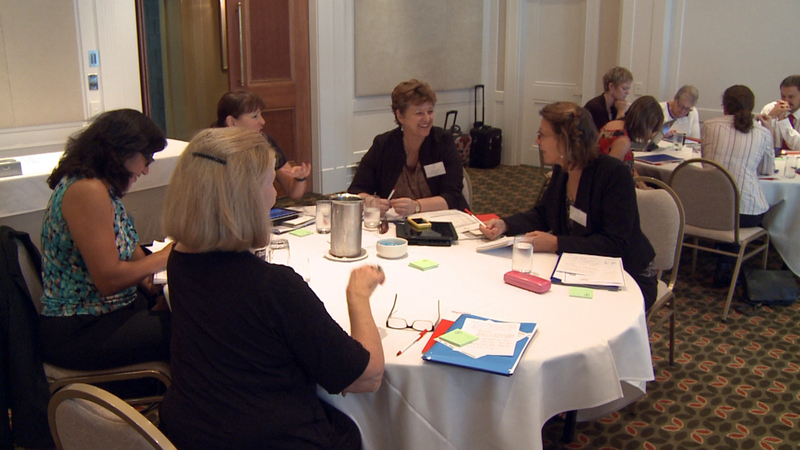 The Project Roundtable was held in Brisbane on 28 February and 1 March 2013 (Roundtable Agenda). Following an introductory presentation by Dr. Tracey Bretag (Project Leader) and an overview of the work of the Higher Education Standards Panel by Professor David Siddle, the Roundtable brought together the project team and reference group in a collegial environment to allow participants to share the practical implementation details of exemplary academic integrity policy. Participants were encouraged to share details of institutional practices which show the efficacy of their policies in their specific contexts using the Framework for sharing best practice provided by the Project. Each participant at the Roundtable was also provided an Information Sheet , Consent Form and the Core elements paper by Bretag et al (2011). Presentations were videotaped and notes were taken during the Roundtable to enable the project team to analyse and adapt current best practices for the identified student groups. 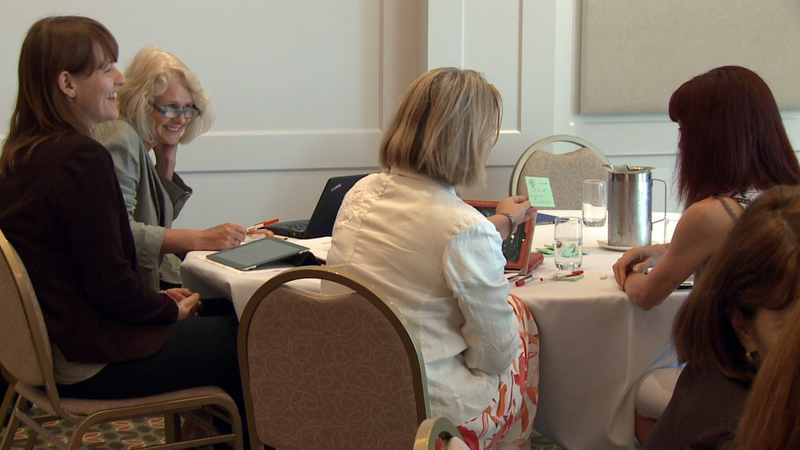 The findings from the Roundtable have been disseminated via a national speaking tour by international academic integrity experts, Dr Erica Morris and Dr Tricia Bertram Gallant. Griffith University1 (wmv, 91.2MB) presented by Ms. Karen van Haeringen and Associate Professor Wendy Loughlin (PDF, 1.14MB). Videos embedded in the presentation: Theoretical underpinnings , Responsibility , Support . 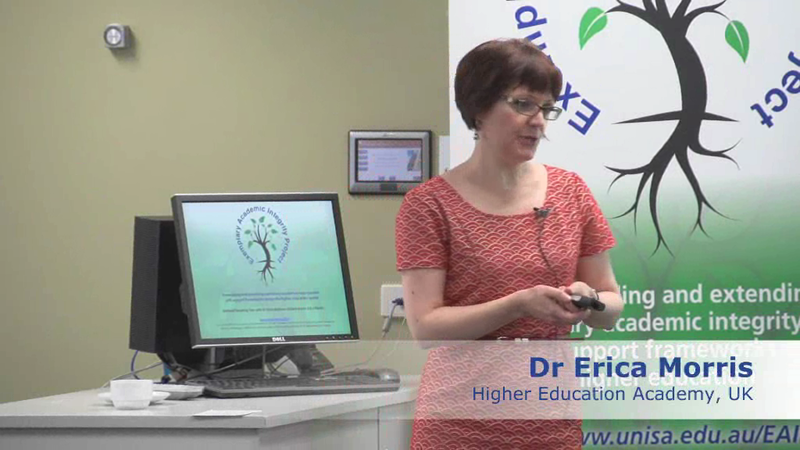 University of South Australia (wmv, 81.8MB) presented by Dr. Rowena Harper (PDF, 247KB). La Trobe University (wmv, 100MB) presented by Mr. Bruce Carboon (PDF, 322KB). University of Western Australia (wmv, 68.5MB) presented by Assistant Professor Lee Partridge (PDF, 1.53MB). Victoria University presented by Dr. Fiona Henderson (wmv, 75.3MB) on behalf of Professor Helen Borland, Associate Professor Bill Eckersley and Dr. Fiona Henderson (PDF, 3.01 MB). Ms. Leigh Pointon presented the QIBT perspective (wmv, 102MB) as a private higher education provider and Ms. Karen van Haeringen presented her analysis of online academic integrity policy of non-university higher education providers using the five core elements framework. The joint presentation is available here (PDF, 1.56MB). 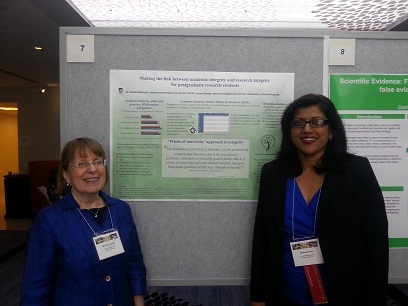 Dr. Saadia Mahmud and Dr. Tracey Bretag presented some preliminary findings from their review of academic integrity policy for higher degree by research (HDR) students in Australia. The joint presentation is available here (PDF, 871KB) Further findings will be presented at the upcoming 3rd World Conference on Research Integrity at Montreal, Canada in May 2013. 1 An internal presentation by Ms Karen van Haeringen provides further information on Griffith University's management of academic integrity (PDF, 640KB). Following the Roundtable at Brisbane on 28 February and 1 March 2013, our two international experts Dr Tricia Bertram Gallant and Dr Erica Morris, engaged in a national speaking tour, between them making presentations at UniSA, Griffith University, La Trobe, University of Western Australia, and Macquarie University. The seminars were open to all higher education providers. The presentation of the findings from Roundtable can be accessed here. An overview of the project was presented at each seminar by a project team member (Dr Tracey Bretag at Perth, Adelaide and Melbourne), Ms Karen van Haeringen at Brisbane and Dr Saadia Mahmud at Sydney. The project overview presentation can be accessed here. The presentation by Dr Tricia Bertram Gallant of her work at the University of California, San Diego can be accessed here (PDF, 2.33 MB). Dr Erica Morris, Academic Lead for Assessment and Feedback at the Higher Education Academy (HEA) in the UK, previously a Senior Advisor leading the Academy JISC Academic Integrity Service (UK). Morris is the lead author of the HEA publications: Policy works: Recommendations for reviewing policy to manage unacceptable academic practice in higher education, and Supporting academic integrity: Approaches and resources for higher education (2011). Dr Erica Morris's seminars in Australia were at Griffith University (Brisbane, Queensland) on 4 March 2013, University of South Australia (Adelaide, South Australia) on 6 March 2013; and La Trobe University (Melbourne, Victoria) on 8 March 2013. The presentation by Dr Erica Morris of her work at the Higher Education Academy can be accessed here (PDF, 892KB). Access: The policy is easy to locate, easy to read, well written, clear and concise. The policy uses comprehensible language, logical headings, provides links to relevant resources and the entire policy is downloadable as in an easy to print and read document. Approach: Academic integrity is viewed as an educative process and appears in the introductory material to provide a context for the policy. There is a clear statement of purpose and values with a genuine and coherent institutional commitment to academic integrity through all aspects of the policy. Responsibility: The policy has a clear outline of responsibilities for all relevant stakeholders, including university management, academic and professional staff, and students. Support: Systems are in place to enable implementation of the academic integrity policy including procedures, resources, modules, training, seminars, and professional development activities to facilitate staff and student awareness and understanding of policy. Detail: Processes are detailed with a clear list of objective outcomes, and the contextual factors relevant to academic integrity breach decisions are outlined. 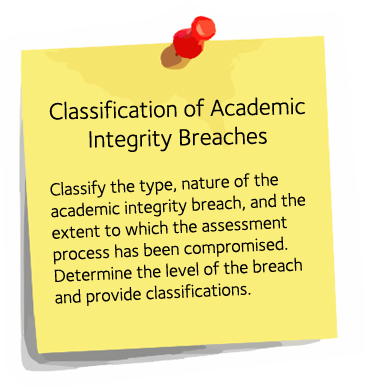 The policy provides a detailed description of a range of academic integrity breaches and explains those breaches using easy to understand classifications or levels of severity. Extensive but not excessive detail is provided in relation to reporting, recording, confidentiality and the appeals process. Academic integrity champions: Data from all five institutions’ presentations were coded under this theme. ‘Academic integrity champions’ were from: outside the academy, management, staff and students. Academic integrity education for all stakeholders: Data from all five institutions were coded under the theme ‘educative approach’, corresponding with the project team’s preliminary analysis that indicated the importance of academic integrity education, and with the AISP recommendation for support. Student engagement: Presenters recognised the importance of encouraging students to be partners, rather than passive recipients in academic integrity education, and data from all five institutions were coded under ‘student engagement’. Tracey Bretag presented this preliminary work at the Plagiarism Across Europe and Beyond Conference, in Brno, Czech Republic on 12 June 2013. The keynote presentation can be found here. Bretag, T., Mahmud ,S., Wallace M., Walker R., Green M., East J., James C., McGowan U., and Partridge L. (2011). Core elements of exemplary academic integrity policy in Australian higher education. International Journal for Educational Integrity, 7(2): 3–12. Bretag, T & Mahmud, S. (2013, under review). Enacting exemplary academic integrity policy: An evidence-based framework. Submitted for review on 25 November 2013 to Studies in Higher Education. Academic integrity means acting with the values of honesty, trust, fairness, respect and responsibility in learning, teaching and research. It is important for students, teachers, researchers and professional staff to act in an honest way, be responsible for their actions, and show fairness in every part of their work. All students and staff should be an example to others of how to act with integrity in their study and work. Academic integrity is important for an individual's and a school's reputation. We encourage all higher education providers to use the simplified definition above to assist EAL students to understand the complex and sometimes confusing concept of academic integrity. This definition has been translated into Mandarin by the Building Academic Integrity Project and the Mandarin version is available here. The following videos on academic integrity have been selected by the project team using a set of criteria that included video quality, duration, having student appeal, and providing an educational approach . These details are provided as introductory material for each video and are summarised in our Selection Table. Referencite by the University of Auckland. Includes quizzes and short videos from the perspective of students from a variety of cultures. List of academic integrity tutorials compiled by University of Windsor, Canada. List of academic integrity resources compiled by the Building Academic Integrity Project, led by Victoria University, Australia. Student resources on academic integrity compiled by the Higher Education Academy, UK. News stories about plagiarism compiled by James Cook University, Australia. 1 For an illustration of how the You Tube videos can be used in an activity session at your institution click here. In a rapidly changing and competitive higher education sector, postgraduate research education is also experiencing changing practices. Our research in six Australian universities challenges the presumption of HDR students holding prior knowledge of academic integrity. Our findings indicate that many postgraduate students are undertaking the research phase of their academic careers seriously under-prepared and ill-informed of their institution’s requirements. We propose that Australian universities should aim to induct postgraduate research students into an overarching institutional culture of integrity.. 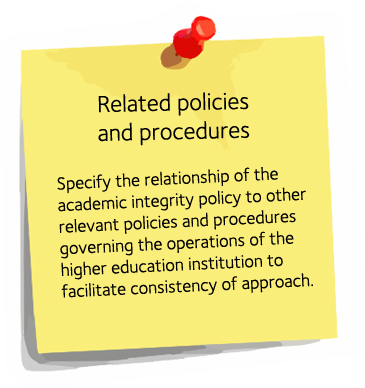 Academic integrity policy that includes the five core elements of exemplary policy, i.e. access, approach, responsibility, detail and support. Policy on integrity in postgraduate research that meets the standards of exemplary academic integrity policy. Measures to enact such policy including adherence to the Code, consistency in policy and practice, and socialisation of trainees with researchers modelling responsible research practice. Dr Saadia Mahmud recently presented a poster based on her research with Dr Tracey Bretag, 'Making the link between between academic integrity and research integrity for postgraduate students', at the 3rd World Conference on Research Integrity, Montreal, Canada, and a poster 'Beyond compliane: Nuturing an institutional culture of integrity' at the Australasian Research Managers Conference (ARMS 2013), Adelaide, Australia on 12 September, 2013. Click on the poster image below to open the file. The photo of Dr Saadia Mahmud wih Professor Melissa Anderson, Conference Convenor of 3WCRI was taken on 8 May, 2013 at Montreal, Canada. The posters above refers to Mahmud & Bretag (2014) review of 9 online academic integrity policies for HDR students against the Code and the five core elements of exemplary policy identified by the Academic Integrity Standards Project i.e. Access, Approach, Responsibility, Detail and Support. The authors found inconsistency with the Code in the definition of research misconduct and a lack of adequate detail and support. We propose linking the specific requirements for postgraduate research students from a university’s main academic integrity policy to ensure a consistent and educative approach to integrity across the university. 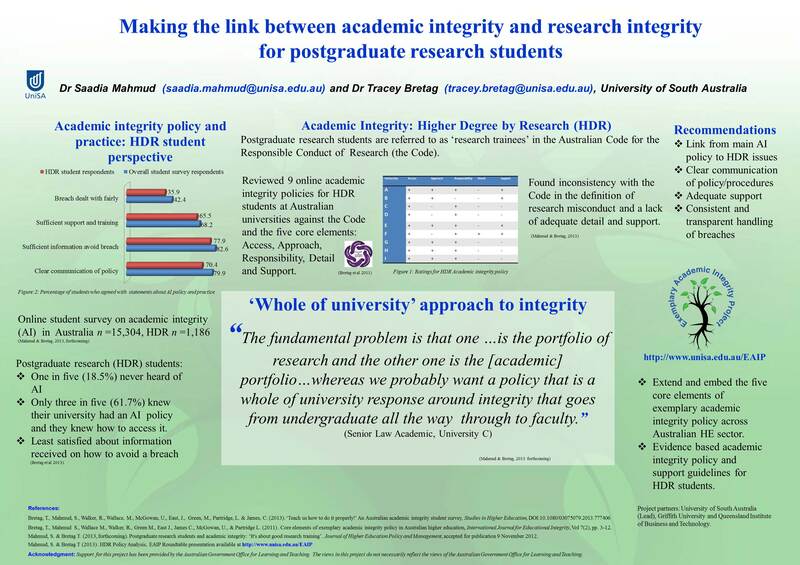 The poster presented at ARMS 2013 includes the Evidence-based policy and support framework to foster integrity in postgraduate research..
 Mahmud, S. & Bretag T. (2013). Postgraduate research students and academic integrity: ‘It's about good research training’. Journal of Higher Education Policy and Management, 35(4),432-443. Mahmud, S. & Bretag T. (2013). Fostering integrity in postgraduate research: An evidence-based policy and support framework. Accountability in Research, DOI:10.1080/08989621.2014.847668 published online 18 November. Postgraduate research students are referred to as ‘research trainees’ in the Australian Code for the Responsible Conduct of Research (the Code). The following short scenarios have been developed for postgraduate students and their supervisors to stimulate discussion and understanding of the sections of the Code. Elsevier offers a range of Publising and Research Ethics resources including online lectures, quick guides, interactive courses and videos on authorship, plagiarism, research fraud, publishing ethics and competing interests. Queensland University of Technology's research skills tutorial "Advanced Information Research Skills (AIRS)" is suitable for postgraduate research students and researchers at QUT and external to the university. The content is freely available. 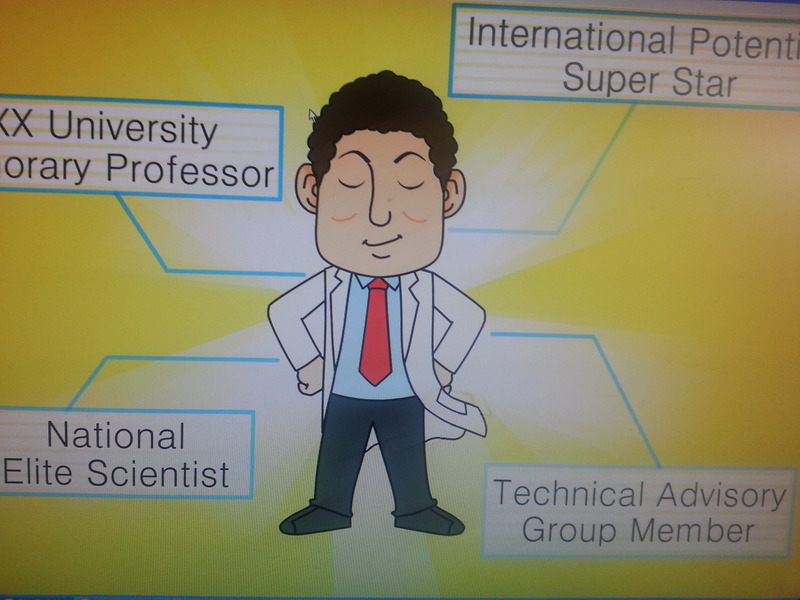 We gratefully acknowledge permission from Professor Chou, Institute of Education, National Chiao Tung University, Taiwan to display the following animations developed for graduate research training at her university. The animations are intended to capture student interest and open a conversation on integrity especially with students for whom English is an Additional Language (EAL). Click on the image to view an animation. "I am a great scientist" explores the ramifications of pursuing research in an unethical manner. (4 MB, exe file). Duration: 2 minutes, English text. 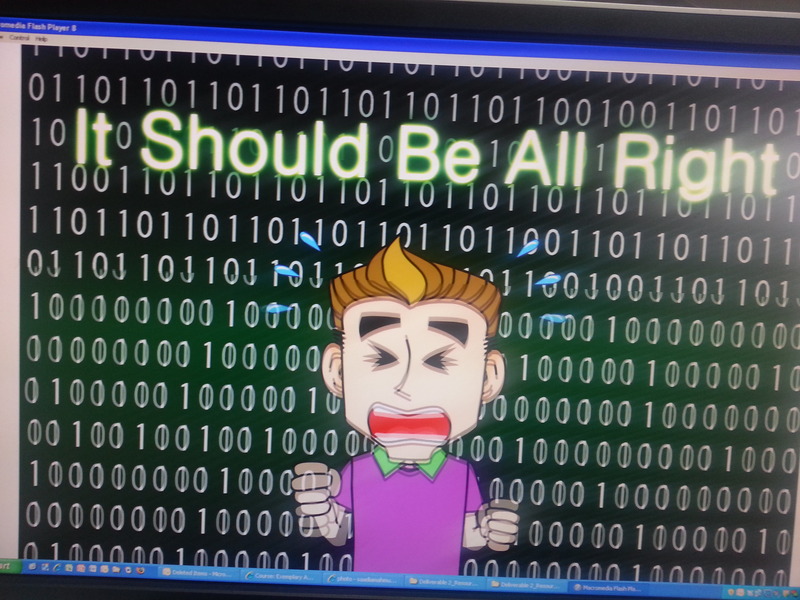 "I should be be all right" finds a postgraduate research student wrestling with the issue of data manipulation. (4.5 MB, exe file). Duration: 2 minutes, Chinese audio with English subtext. Colloborative Institutional Training Initiative (CITI) offers the CITI Program that includes Responsible Conduct of Research (RCR) courses. Epigeum (UK) offers an online Research Integrity Programme for undergraduate, post graduate and early career researchers to create an understanding of the responsibilities of researchers. The Office for Research Integrity (USA) commenced in 1992 and oversees research integrity activities in the Public Health Service (PHS) in USA. Research Integrity The Australian Research Council provides information on the Australian Research Integrity Committee that commenced in February 2011 to review institutional processes that respond to allegations of research misconduct. Retraction Watch Online blog about retractions of academic papers. Mahmud, S & Bretag, T (2013. Fostering academic integrity in postgraduate research: An evidence-based policy and support framework. Accountability in Research, DOI:10.1080/08989621.2014.847668 published online 18 November. more effectively implementing and supporting their existing Academic Integrity policy. 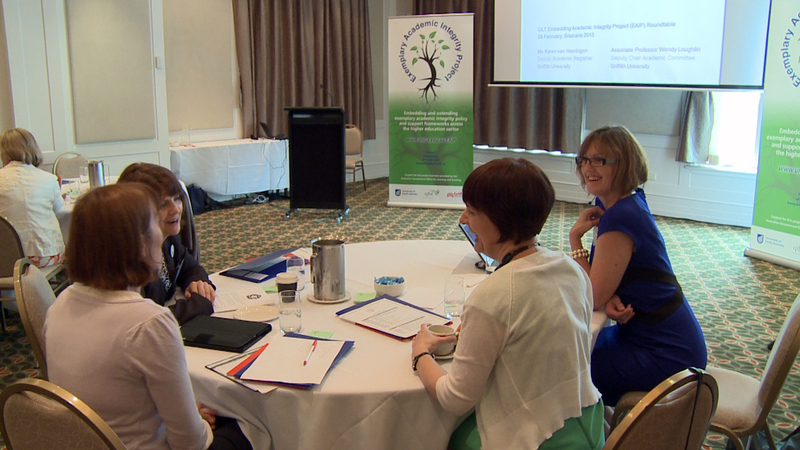 Building capacity within Australian HE providers to develop an institutional culture of academic integrity. Feedback on the use of the toolkit, its value to higher education providers and suggested improvements are welcome via the Feedback link. 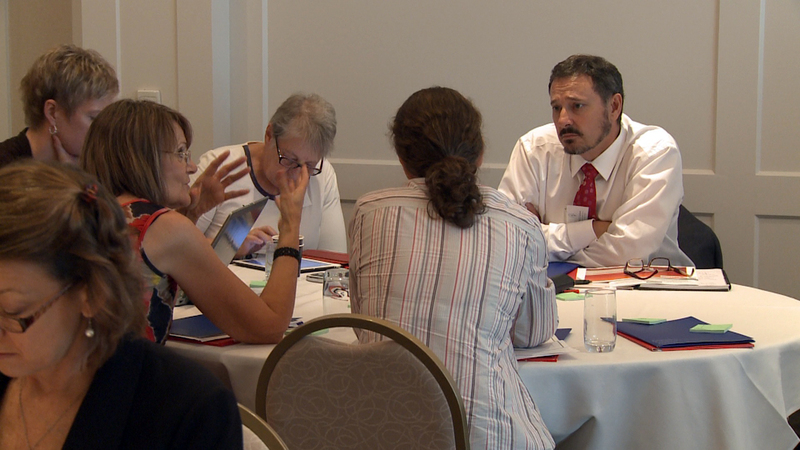 The Exemplary Academic Integrity Project Roundtable, Brisbane, 28 Feb-1 March 2013. This is the primary method for locating the policy. Select a title which best reflects both institutional approach and ease of access. Access: The policy is easy to locate, easy to read, well written, clear and concise. (AISP 2010-2012). Approach: Academic integrity is viewed as an educative process and appears in the introductory material to provide a context for the policy. There is a clear statement of purpose and values with a coherent institutional commitment to academic integrity through all aspects of the policy. (AISP 2010-2012). Examples: University of Western Australia, and Victoria University. Higher Education Academy (HEA) 'Policy works' Recommendation 3, p.11 - Establish a central web area on the institutional website that gives structure and coherence for the policy and related guidance, so staff and students can readily access up-to-date documentation. Examples: University of Western Australia, and La Trobe University. Search terms for ease of access: Policy makers should work with web developers to ensure that appropriate meta-data is included so that all stakeholders can easily find the policy using a range of appropriate search terms. Some examples include: academic integrity, academic honesty, academic misconduct, research integrity, academic integrity breach, plagiarism, acknowledgement, academic writing conventions, citation, quoting, paraphrasing, summarising, collaboration, copyright, intellectual property, plagiarism, cheating, collusion, data fabrication, misrepresentation, assessment, plagiarism detection, text-matching software. Languages for ease of policy access: International students and domestic students from ESL backgrounds may experience cultural and linguistic barriers when asked to respond to a concern of a possible breach of academic integrity. To deliver a policy that is accessible, meaningful and relevant to this student group the academic integrity policy may be provided in a range of languages. Example: Griffith University in cooperation with the Student Representative Council provides its Student Academic Misconduct Policy in Arabic, French, Hindi, Korean, Shona, Simplified Chinese, Spanish, Traditional Chinese and Vietnamese. Higher Education Academy (HEA) Policy Works Recommendation 1, pp.8-9 – Establish a cross-institutional committee supported by senior management …with a remit for promoting academic integrity across the institution. See HEA – JISC example - The University for the Creative Arts, p.22. See HEA- JISC illustrative case – The University of Leeds, pp.23-24. Policy scope clarifies to whom the policy applies and for what actions. Examples: The University of Adelaide and University of Canberra. Policy purpose states the institution’s reason for the policy and the desired outcome. Examples: La Trobe University, University of Western Australia and Macquarie University. "Academic integrity means acting with the values of honesty, trust, fairness, respect and responsibility in learning, teaching and research. It is important for students, teachers, researchers and all staff to act in an honest way, be responsible for their actions, and show fairness in every part of their work. Staff should be role models to students. Academic integrity is important for an individual’s and a school’s reputation." Please use the following citation when referring to this resource: Exemplary Academic Integrity Project (EAIP): Embedding and extending exemplary academic integrity policy and support frameworks across the higher education sector (2013), Plain English definition of Academic Integrity, Office for Learning and Teaching Strategic Commissioned Project 2012-2013, http: www.unisa.edu.au/EAIP . Support: Enabling strategies enact the policy. Without long-term, sustainable and practical support resources, a policy will not be enacted, no matter how well it is articulated. (AISP 2010-2012). Examples: University of Sydney,University of South Australia, and University of Western Australia. See a template for providing Turnitin information to students. "This involves promoting integrity in every aspect of the academic enterprise, including university mission statements and marketing, admissions processes, academic integrity policies, assessment practices and curriculum design, information during orientation and in embedded and targeted support in courses and at every level for students. It encompasses frequent and visual reminders on campus, professional development for staff and research training." (Bretag 2013, Short-cut students, Transparency International Global Corruption Report). Implementation of the academic integrity policy including procedures, resources, modules, training, seminars, and professional development activities to facilitate staff and student awareness and understanding of policy. Practical strategies to prevent breaches of academic integrity. (AISP 2010-2012). Detail: Adequate but not excessive detail is provided in relation to reporting, recording, confidentiality and the appeals process. The policy provides a detailed description of a range of academic integrity breaches (AISP 2010-2012). Examples: The University of New England, and University of South Australia. Examples: The University of New England, University of Western Australia, and Griffith University. Examples: The University of Adelaide, and LaTrobe University. Four of the five universities with exemplary academic integrity policies and represented at the EAIP Roundtable (Brisbane, 28 February 2013) recommended that there should be a decision-maker (or decision-makers, depending on the size of the department and the number of cases) located within the faculty with designated authority to determine outcomes for academic integrity breaches. This person might be referred to as an Academic Integrity Officer, Academic Conduct Advisor or Faculty Academic Misconduct Officer (Bretag & Mahmud, in progress). Example: University of South Australia, Higher Education Academy (HEA) 'Policy works' Recommendation 4 (p.12): Develop strategies for staff engagement and development to help ensure that the policy and procedures are consistently followed. Detail: Adequate but not excessive detail is provided in relation to reporting, recording, confidentiality and the appeals process. The policy incorporates simple flow charts to demonstrate how the policy is enacted in practice. (AISP 2010-2012). Data from presentations of all five institutions with exemplary academic integrity policy at the EAIP Roundtable (28 February 2013) were coded under the theme ‘tools for decision-making’, with presenters agreeing on the importance of providing academic integrity breach decision-makers and other stakeholders with a simple flowchart that details specific roles and tasks. Examples : The University of Melbourne has a flowchart showing the process for an allegation of misconduct. See also Griffith University (Sections 6-10). 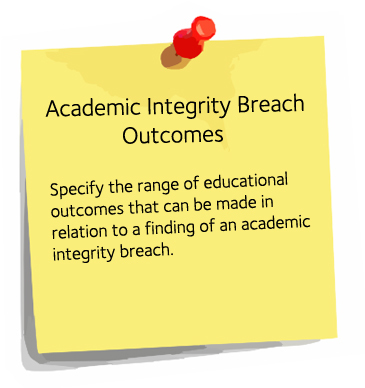 Example: The Academic Integrity policy at Queensland University of Technology (QUT) provides a description of how a potential academic integrity breach is identified, usually in the first instance by the teaching staff member. Detail: Adequate but not excessive detail is provided in relation to reporting, recording, confidentiality and the appeals process (AISP 2010-2012). 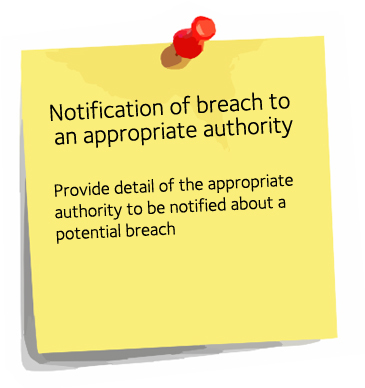 Example: The University of Newcastle’s policy provides detail of the appropriate authority to be notified of a suspected academic integrity breach. At the University of Newcastle, these authorities include Student Academic Conduct Officers or Advisors in Research Integrity. Academic integrity policy toolkit: Referral of breach to academic integrity decision maker. Example: The University of South Australia has designated Academic Integrity Officers located within faculties who are responsible for managing academic integrity breaches, from the initial identification of the breach, through to communicating and meeting with the student. Staff members with concerns liaise directly with the AIO. See a template of a letter to a student regarding the Referral of breach to a decision-maker. Academic integrity policy toolkit: Preliminary assessment by decision maker. 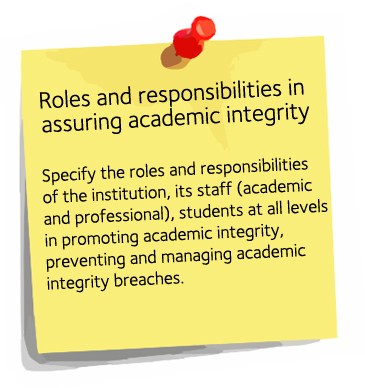 Example: In making a preliminary assessment of academic integrity breach allegations, Academic Integrity Officers (AIOs) at the University of South Australia take into account a range of relevant factors, as below. In those instances where the AIO determines that there is a case to investigate, these factors continue to influence decision-making. Provide students with a meaningful and supported opportunity to prepare a comprehensive response to the allegation within a specified timeframe. See Section 10. "Observe Natural Justice" (p.7) in the Good decision-making guide from the Queensland Ombudsman. Examples: Victoria University and University of South Australia. See two templates of letters sent to a student about an allegation of a breach Letter 1 and Letter 2. Example: Queensland University of Technology. 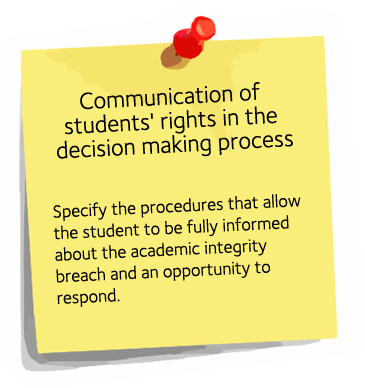 This example provides details of the actions available to students when they respond to an allegation of an academic integrity breach. In particular, see points (v) to (ix) which specify details relating to who can attend the meeting and what support is available to the student. Students' academic integrity breaches do not occur “in some atemporal ether” (Howard 1999, p. 164). An Academic Integrity Decision-Maker needs to take into account the extent of the plagiarism, the student’s intention and/or motivation, the conventions of the discipline, the student’s knowledge of academic conventions and the impact of the outcome on the student’s progression. Other contextual factors such as the student’s learning background, their level in the academic program and any other previous breaches, may also need to be taken into account (Bretag 2008, p. 4). Each case should be decided on its individual merits and without bias or pre-judgement. Examples: University of South Australia , and La Trobe University. Bretag, T. (2008) Responding to plagiarism: The need to engage with students’ ‘real lives’, paper presented in the refereed stream of the ATN Assessment Conference: Engaging students in assessment, University of South Australia, 20-21 November. Howard, R.M. (1999). Standing in the shadow of giants: Plagiarists, authors and collaborators. Volume 2,Perspectives on writing: Theory, Research and Practice, Ablex Publishing Corporation, Stamford, Connecticut. Example: Griffith University provides clear guidance of the details that the Student Academic Integrity Coordinator needs to include in communicating the decision to the student about the outcome (penalty) for an academic integrity breach. See a template of a Closure letter communicating the decision to a student that an academic integrity breach has occurred. See a template of a No case letter communicating the decision to a student that no academic integrity breach has occurred. 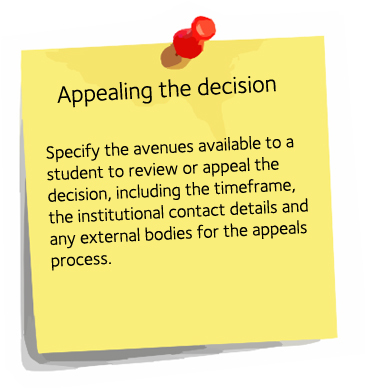 See a template of an Appeal decision letter communicating the outcome of an appeal to a student. Enacting exemplary policy in practice requires that academic integrity breach data is confidentially maintained, secure, managed and analysed for the purpose of process improvement, quality assurance, procedural fairness, transparency, and improvement of teaching and learning (EAIP Roundtable Dissemination Presentation 2013). It is important to outline in what circumstances the records may be accessed for internal and external purposes. Specify if any notation is to appear on the student's transcript or memorandum of results. Data from the presentations of all five institutions with exemplary academic integrity policy at the EAIP Roundtable (28 February 2013) were coded in the theme ‘central recordkeeping’. As an educative approach to academic integrity is a key purpose of the policy the record is to include opportunities provided or requirements for the student to learn through the completion of an Academic Integrity Student Tutorial or by seeking help from a Learning Advisor. These records (e.g. Learning Advisor Referral form) are used to guide the further education of the student if another breach of academic integrity is identified. An academic integrity policy should detail how a student makes an appeal, following appropriate procedure (JISC, 2005, p19). Examples: University of Melbourne and University of Western Australia. See a template of a Closure letter communicating the decision to a student that an academic integrity breach has occurred and the right to appeal. Exemplary Academic Integrity Project (EAIP): Embedding and extending exemplary academic integrity policy and support frameworks across the higher education sector (2013), <resource name>, Office for Learning and Teaching Strategic Commissioned Project 2012-2013, http: www.unisa.edu.au/EAIP .